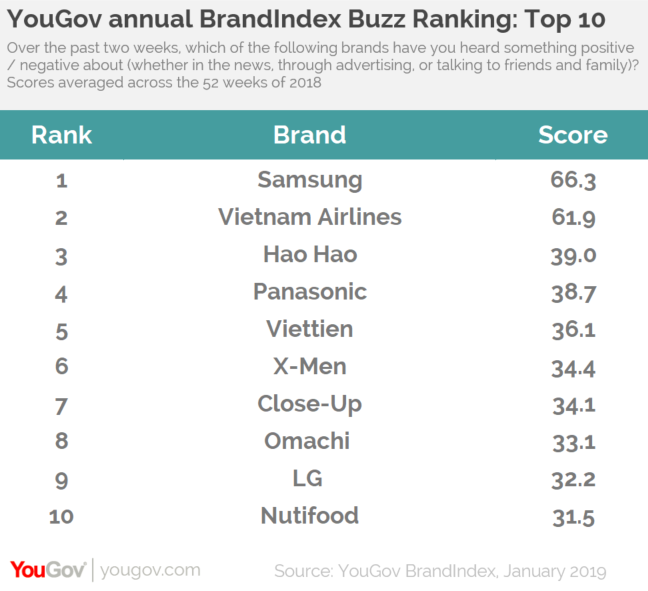 South Korean electronics manufacturer Samsung heads YouGov annual BrandIndex Buzz ranking, taking the top spot for the third year in the row. Vietnamese brands have a strong presence in the top ten. Local carrier Vietnamese Airlines comes in second place (61.9), instant noodle brands Hao Hao in third (39.0) and Omachi in eighth (33.1), fashion retailer Viettien in fifth (36.1), men’s personal care brand X-Men in sixth (34.4), and nutrition brand Nutifood in tenth (31.5). Two appliance makers make the top ten with Japanese Panasonic in fourth (38.7) and South Korean LG in ninth (32.2), while the list is completed with toothpaste brand Close-Up in seventh (34.1). 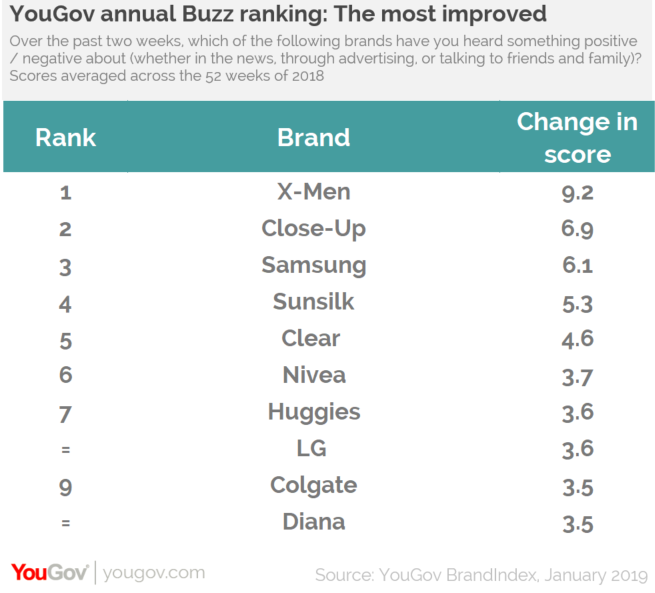 YouGov also reveals which brands have the most improved Buzz scores. X-Men comes up on top with a rise of 9.1 points, ahead of Close-Up (up 6.9 points) and Samsung (up 6.1 points). Ervin Ha, Head of Data Products commented: “Vietnamese brands dominate this year’s Buzz Rankings – taking seven of the top ten places. However, Samsung still takes the top spot for the third year in the row, demonstrating how good it is at generating ongoing consumer Buzz about its products."